We will need the following 2 command line utilities to be installed in our server. They are very small in size and does their job properly. 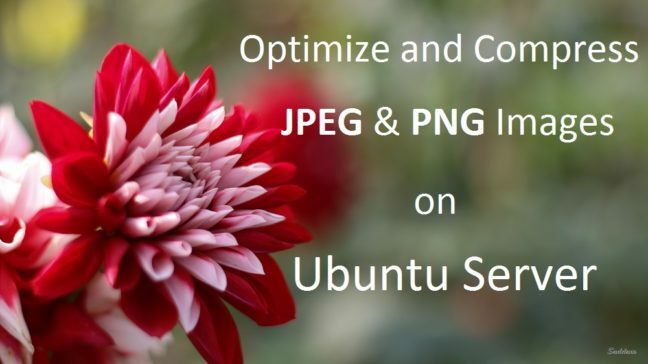 In this tutorial I’ll be bulk optimizing and compressing JPEG + PNG files in my Ubuntu 14.04 server using a Terminal window and a line of command for each file types. First of all, we need to install the utilities. Try not to use root user to download and install the apps / utilities. A user with sudo privilege is preferred. Run these if you don’t have the utilities already installed. If installed skip this step. Open a terminal window. Browse to the specific folder or sub-folder location where you have all the JPEG files stored which needs to be optimized and compressed using the cd command, then run the following command. It may take some time if you have loads of jpeg files. The above command will find all .jpg files inside current folder and sub-folder(s) and will optimize them while preserving quality of the files. Similarly, to optimize and compress PNG files, browse to the location of your PNG files and run the following command in terminal. Compressing PNG files takes a bit longer than compressing JPEG files. But, the information remains intact in your PNG files, they don’t get removed. The commands above with sudo changes the file ownership to root:root. You may notice that, optimized images are not displaying in your site, use the following command after you use jpegoptim and OptiPNG. The command changes back the ownership recursively to www-data, the right owner of the files and images now should be displaying on your site. I use them in my server every time I upload any image(s). Great! Can I do it on Ubuntu Desktop?! Yes, Imamiash. You can use it on Ubuntu desktop.